I was a small child growing up in our first house. I knew what I liked and I knew where to find it. A kitchen chair was all I needed to make it to the next step: the kitchen counter. From there I could stand up and reach the top cabinets. That’s where the Pepto-Bismol was hiding. With my favorite cup in hand, I poured myself a generous serving of the only one that coats. … the only one that coats. Unbeknownst to me, a phone call to poison control was taking place while one of my parents tended to me and my favorite cup. Soon after I learned more than I wanted to know about induced vomiting. The episode cemented the monkey cup in the Legend of John. Caveat: John may have mixed his meds this morning. My father had surgery yesterday. It was nothing serious: hernia surgery. However, even though my father was ambulatory* after the surgery, my mother can’t be left alone and my father was still not one hundred percent. So I came over to stay the night. It’s not like it’s out of the way, or a tremendous burden. The second house I did my growing up in is just a mile or two up the street. One of my endearing qualities is I always go rooting around the house looking for memories when I come over. 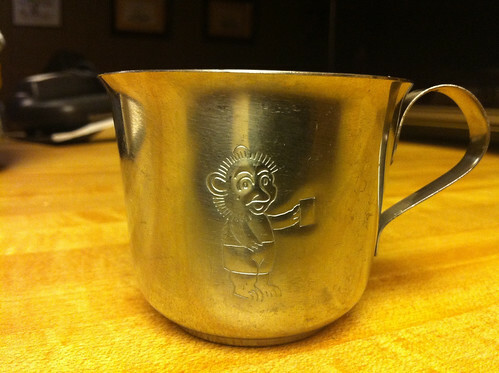 That’s how I came across the long lost monkey cup, hiding in the bottom of the china cabinet. Now you can know and love the monkey cup as much as I do.